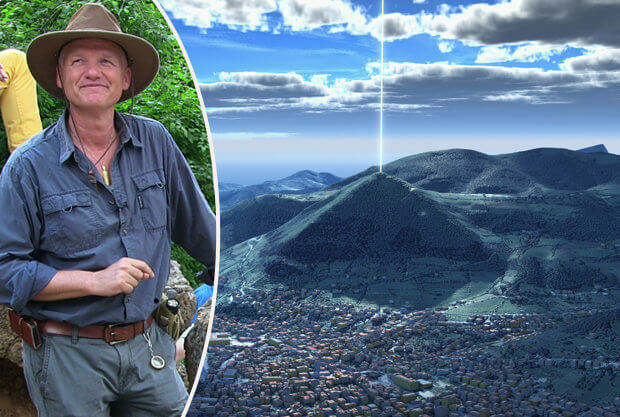 Massive structures dating back tens of thousands of years have been unearthed in Bosnia – including the Pyramid of the Sun.Top archeologist Dr Sam Osmanagich, who claims he found the pyramids, says the Pyramid of the Sun is the largest pyramid in the world – dwarfing the Great Pyramid of Egypt.Dr Osmanagich said he discovered the structures by chance after visiting the town of Visoko.He’s spent thousands of hours excavating the site and presenting his findings to universities.Some claim Dr Osmanagich’s findings are a hoax – but the professor is adamant the structures are real and claims everything we have been told in ancient history is WRONG.He told Daily Star Online how the valley of pyramids “consists of five pyramidal structures” he’s named Sun, Moon, Dragon, Mother Earth and Love. The pyramids are the first of their kind discovered in Europe while the Bosnian Pyramid of the Sun stands at more than 220 metres – 73 metres taller than the Great Pyramid of Egypt. He said: “For thousands of years locals have considered those hills to be natural phenomenon because they were cover by one metre of soil and vegetation.“However, when I first saw their triangular faces, obvious corners and orientation toward the cardinal points, I knew that they had to be constructed by intelligent hands.“Since I had been investigating pyramids for decades I knew that the pyramids found in China, Mexico, Guatemala, Honduras or El Salvador presented the same case of pyramids covered by dirt and vegetation.”Studies suggest the pyramids are covered in soil aged around 12-15,000 years old but fossilised leaves on top of the pyramids are around 34,000 years old – making them the oldest known pyramids on the planet. Dr Osmanagich said a secret underground tunnel and chamber network – running for more than 10 miles – was also uncovered. He said: “Mega ceramic sculptures have been discovered in the underground labyrinth with a mass of several tonnes which make them the largest found so far in the ancient world. “Under every original old pyramid (Shaanxi in China, Giza and Saqqara in Egypt, Teotihuacan and Palenque in Mexico) underground tunnels were built as a part of construction. Same goes for the Bosnian Pyramids. “A Network of tens of kilometers in pre-historic underground tunnels, intersections and chambers are located under the pyramid valley. An electromagnetic field is said to beam out from the Pyramid of the Sun, according to Dr Osmanagich, creating a “huge energy machine”.He added: “Almost everything they teach us about ancient history is wrong: origin of man, civilizations and pyramids.“Our development is not linear but cyclical.“Civilizations reach their peaks and global catastrophes wipe them out from the face of the planet. New beginning follows.“We live only in the last civilizational cycle. “Original pyramids (Giza, biggest Shaanxi in China, Teotihuacan, Bosnia) were used as huge energy machines: they were emitting electromagnetic fields, creating ultrasound and more energy phenomena. But the archaeologist said there have been “difficulties” and “opponents” to the pyramids since he started exacting the site.“Cultural establishment of Bosnia, but also Europe, the US and Egypt, have been doing everything to stop the excavation, writing petitions to Bosnian governments, trying to discredit us on internet sites”, Dr Osmangich added.“However, truth has been prevailing. “What they have are the opinions, such as ‘it’s impossible to have pyramids in Bosnia’, but they’ve never come with a single test, analysis or dating. “So, their opinions are irrelevant. Science needs scientific arguments.“It’s true that some archaeologists in Egypt, Mexico, Germany or USA do not understand us today and try to laugh at us.“However, fifty years from now, people will be laughing at our mainstream scientists today and their lack of knowledge.”Dr Osmangich said the Bosnian pyramids are an “energy device for rejuvenation, regeneration, improvement of the air, water, and food molecular structure”.